I'll keep this brief, so we all can get back to our post-Thanksgiving dinner/Holiday naps. You likely half a fridge full of leftovers right now, and now that you've had a day to recuperate from all of the pie and turkey, it's about time to make a sandwich. This Thanksgiving Leftover French Dip is exactly what it sounds like. Get yourself some fresh French bread, (we used a batard and it was incredibly delicious), heat up your leftovers and pile them on top. Our Friendsgiving leftovers had a few more unusual elements than the traditional meal and that made the sandwich extra good, like the spicy pickles. We've kept the ingredient list here minimal to reflect all of the traditional sides, but you should add as many leftovers as the bread can handle. Also, napkins are definitely required. In a saucepan over low heat, warm gravy. Also over low heat, warm stuffing and turkey in a skillet. While warming, split bread and spread evenly with mayonnaise. 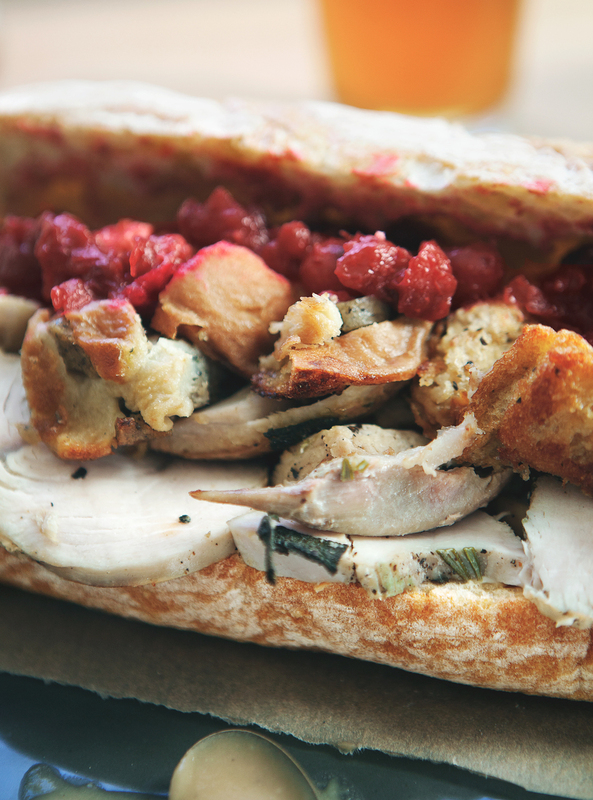 Layer turkey and stuffing into sandwich. Top with cranberry sauce and serve with warm gravy.